Unfortunately, due to high winds and bad weather, the 'Roamin' Rockets' Charity Event tonight has been postponed until January. Will let you know when a new date is decided. As usual, I didn't manage to take any photos of our preview on Friday night! Mainly because it was too busy and we were enjoying ourselves too much! I did however, take some pics (above) of my display yesterday. A great weekend was had by all! I even started my christmas shopping. There were so many lovely things to buy as Christmas presents! I can't say what I bought as it's a secret santa! This is something we do amongst some of us jewellers at Coburg (past and present) every year. I'll let you know once it's opened! Now that that's over, I'm getting myself prepared for the 'Roamin Rockets' Charity Event at Cargo on Thursday evening (earlier post). I'm also making up orders from the Open Event and a few on-liners. So, better get your Christmas present orders in quick! If you couldn't make it down to Coburg House on the weekend, come and visit me at Cargo on Thursday or feel free to contact me, if you'd like to make an appointment to see what I have in stock. Oh, and if you haven't already, please click the facebook icon and 'like' my page! On Tuesday, A-level Art student, Mike spent the day with me in the studio. Mike came up from Kent for the day to do a ring project that we had planned back in August! Now that is dedication for you! Mike told me that although working with a jeweller or a maker of any other discipline, is not part of his course, he likes to set these kinds of projects to challenge himself and his teachers! Mike wanted to make a ring in my stylised technique of fusion. As this was his first introduction to the art of jewellery making, I gave him a choice of two rings to make. 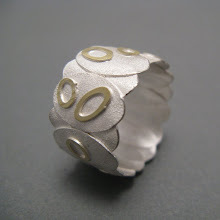 He decided to make a flat shaped band (8mm wide and 1.2 mm depth) with a detailed flat wire which he fused onto the surface along the centre of the flat sheet, before forming it into a ring shape. I demonstrated and guided Mike every step of the way of the ring making process. However, Mike still added his own stamp to it with his extra reticulated surface texture and shiny finish. Here is the finished product and some shots of Mike making his ring! Mike is a very talented, enthusiastic and patient guy, the recipie for a great artist! I wish him all the best with his A levels and studies to follow. For all my Dundee followers, I have new stock in at Dundee Contemporary Arts! I have supplied their shop for a number of years with my work, and to my shame, I have never been along there. It's a little early to think about new year resolutions, but I think this has to be one of many. There'll be no time before christmas, but it is something I must do next year! The rain has stopped now, so it's a good time to whiz around the corner to the studio! Hope the weather is not too wet in Dundee either! No tricks! Just my treat! To celebrate Halloween this year, I have a treat just for you! 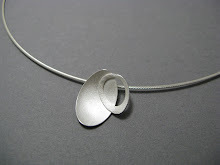 I am offering a 20% discount on any piece of jewellery over £50. This offer ends on the 31st of October and is only open to my blog readers. So if you do fancy treating yourself or being a little christmas early bird, then just contact me either by phone or email and quote this blog post. Hello lovely potential jewellery makers!! I am now taking on more private tuition students! From beginners to the more experienced, I can tailor a course to suit your needs. A course would usually consist of five two hour sessions, costing £200 plus your cost of materials. Single sessions can be booked thereafter at £40 each. One day projects are also available. 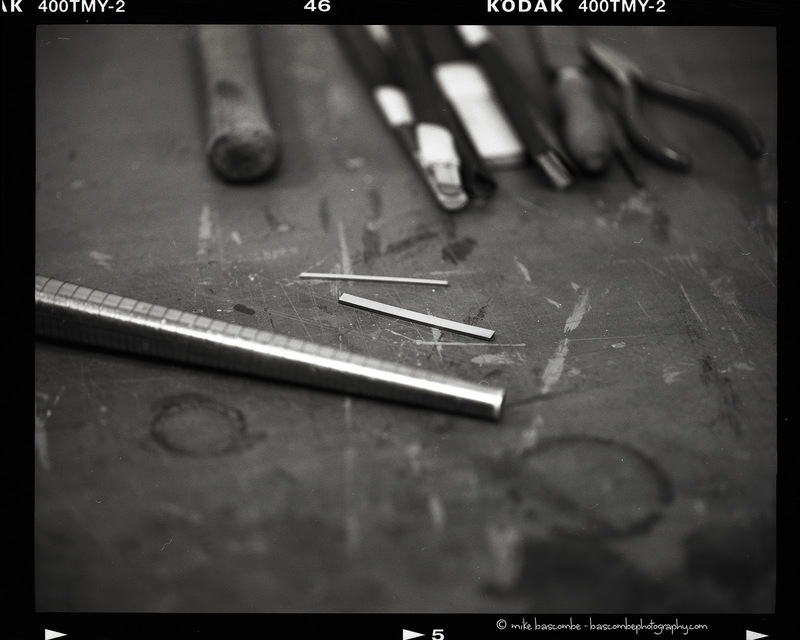 For example, making a simple ring or pendant. For full use of my expertise and my lovely studio in Leith for the day, it would be £100 plus materials. Maybe you know someone who would like this experience as a gift. Vouchers can be given on request. If this is something you might be interested in, then give me a call and we can discuss what you might like to do. I love Stockbridge! So I wasn't complaining this morning when I had to wander down to the Sarah Dallas Gallery to deliver a wee parcel of new goods :) The necklace above was one of them! A light and simple necklace. This is one of my favourites and for a change, I would be tempted to wear it! I know it's a bit peachy, but apparently peach is back in! There was no time for mooching about the charity shops today, as I had to head back to the studio pretty sharp to get on with work! 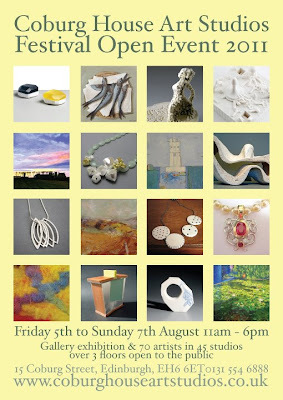 If you live in Stockbridge or it's surrounding areas, check this lovely little gallery out. It is mostly a fine art gallery, however, you will find some real gems in Sarah's gorgeous little vintage cabinet! I hate to say it but Christmas is coming!!! I can't believe it myself, but even I have started my Christmas shopping list! 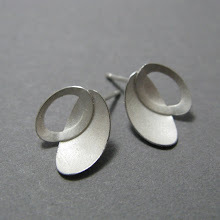 Therefore, as early as it may seem, I have been busy working on new pieces to send to my stockists. Ruthin Craft Centre received a refreshing new winter collection just last week from me. The 'Snow bud' necklace with labradorites and citrines (pictured below in the previous post) has already been sold before even making it to the cabinet! My Lovedazzle page has been updated with some new pieces also! Take a look here. 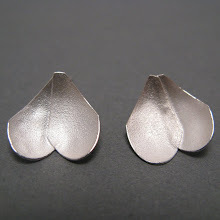 Lovedazzle has an Autumn offer of 20% off any piece of jewellery over £50 up until midnight 17th October! So why not save some pounds and start your Christmas shopping early! Oh dear, I sound like an advert!! I've been working on some new necklaces recently including two new 'Snow bud' neck pieces. I wanted to create something more simple and easier to wear than my usual cluster pieces. 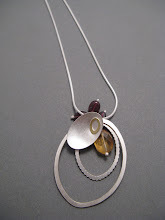 I began with matching the stones up and seeing what shapes and colours work together. The silver snow buds in both pieces are generally the same, but the stones and added chain to one of them give them a different look from each other. The long 'Snow bud' neck piece can be worn at different lengths, according to the size of the wearer and the neckline they choose to wear from day to day. Take a look down the right hand side where there are some other new necklaces just designed and made by moi, just waiting to be snapped up! I recently sent some work off to two new stockists, SH Jewellery in Morningside, Edinburgh and Kalo in the Shawlands, Glasgow. 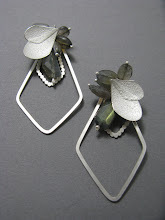 SH Jewellery was opened four months ago by a friend of mine, Sarah Hutchison. This gorgeous shop/gallery has some lovely and interesting jewels, mixing it up with designers from all over the UK, many being from London. 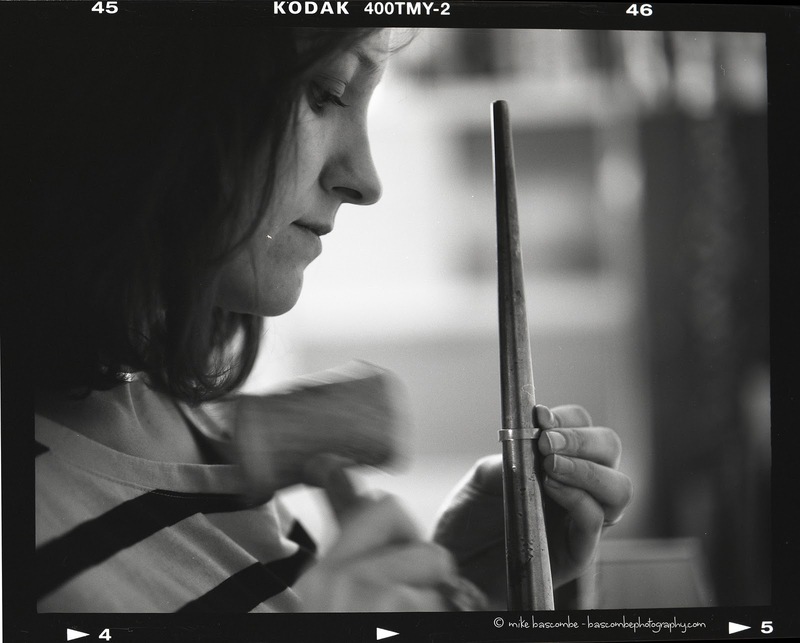 Award winning silversmith and jeweller, Sarah also works at her bench at the back of her shop and is available to chat to most days. There's not another place like this in Edinburgh. If it's interesting, unusual, bespoke jewellery that you're after, then this is the place to go......well apart from Coburg Studios of course!!! The image above is a pendant now on sale at SH Jewellery. Again, loving the greens/greys/blues that the labradorites create in different lights, working well with the yellow/gold citrine and silver. Making some new pieces for Sarah Dallas Gallery in Stockbridge, so watch this space! Picture above :) Merryn is getting used to him slowly! 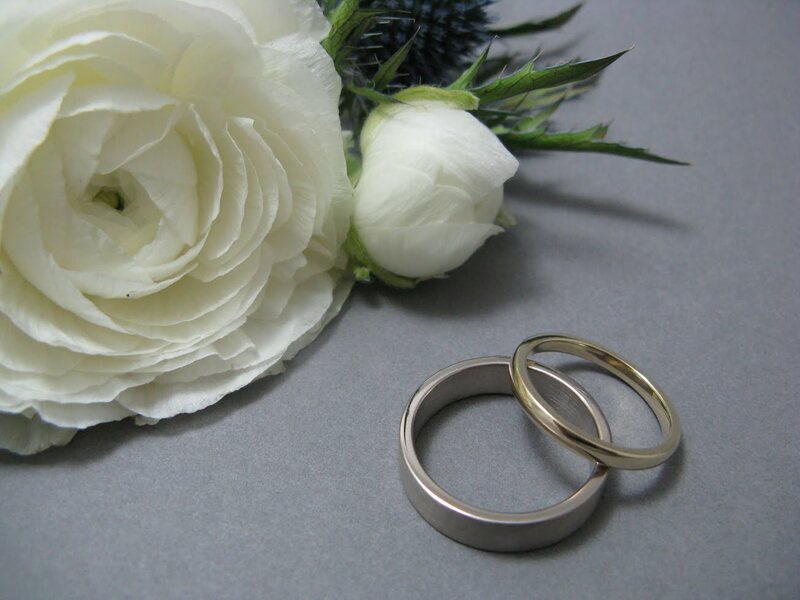 We now have a new facebook page for 'Make Your Own Wedding Rings'! The bookings are coming in now, and we have some lovely couples lined up over the next few months. Follow us on facebook, and if you are getting married and think this could be just for you, then please don't hesitate to contact us. It's been a busy month with the Edinburgh Festival in full swing, Open Studios and 'Dazzle'. Even though it's an exciting time, I'm glad it's over! My evenings are my own again! Phew :) I have been up to this and that but will tell you more later. 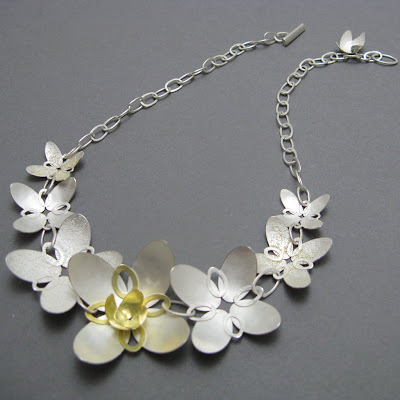 For now, here is a an image of one of my 'Snow bud cluster' Neckpieces. This amongst other pieces has just arrived at Mobilia Gallery in the States for their exciting exhibition 'Objects of Status, Power & Adornment' which starts on the 6th September and ends on the 22nd October. The brief was to make some new pieces with this title in mind. As I have been using semi precious stones over the last couple of years, it seemed to fit in quite well. We were also asked to include an older piece of work, so I revamped an old 'Feather petal' Brooch made from silver and 18ct yellow gold into a fairly large ring! As I was in a rush to send off the work, I forgot to take a photograph. We will just have to wait until it comes back, unless it is sold of course! That would be nice :) So if anyone is around and about in Boston, then go and have a look. I'm sure it'll be an exhibition you won't want to miss! There is also talk of this being a travelling exhibiton, so will keep you updated. Right, I'm off to the studio. I have some rather scrumptious necklaces on the go at the moment. Watch this space! While I was rummaging through the pre Open Studio rubble and through a drawer I hadn't been in for a very long time, I came across these two lovely 'Bud Cluster' brooches, 'Criss Cross' brooch and pendant! Both bud pieces are made up of separate units and soldered together in stages to create these solid but delicate clusters. The 'Criss Cross' pieces are made up of hollow ovals made individually, and fused together to form this patterned sheet. For some reason or another, they all must have been put away to fix in the future as they don't seem to have any pins on them. The far in the future being now, I have decided to fix them, spruce them up and put them in my 'end of line' box! As I have done the past couple of times at Open Studios, this is a '60% off' treat for only Open Studio guests! Many more end of line jewels (smaller pieces too) to be had, so don't miss out! The 'was' prices are the actual prices they were at the time, so with silver and gold going up as they have done recently, makes them extra special bargains that are also one off pieces! And now for Open Studios! Do come and visit us at Coburg House! For you regulars, you know what it's all about and for those of you who don't, pop down and see some of Scotland's award winning artists and makers. A hub of 70 artists including a gallery all in one building! Jewellery, ceramics, textiles, painting, prints and more. Check out the Coburg House website for a taster! Hope to see you all there! If you want to know what's happening throughout the year at Coburg House, Open studios, workshops, new artists etc, become a fan on Facebook! Edinburgh Dazzle is almost here once again! This year it has moved from the Traverse Theatre to George Square Theatre. As usual, there'll be a diverse range of jewellery from 50 jewellers to suit everyone's taste buds! My big box of jewels are ready to send off, including these new pieces! I'll be there most days during the festival! Looking forward to seeing you all there! Apologies once again for not having posted for a while! It has been a hectic couple of months, but not all work I have to say! Vegas and San Francisco had been a well kept secret for six months and last month flew in and flew by just as fast! So my mum and the lovely Michael got married. It wasn't your typical Vegas wedding. I know you're all wondering if Elvis was there, but no, he wasn't. Neither did they get married down town in a white chapel. Mr & Mrs Wynn, funnily enough, decided they would get married in the beautiful wedding suites of The Wynn Hotel! A fantastic day was had by all, well all six of us! Above is a photo of the rings. 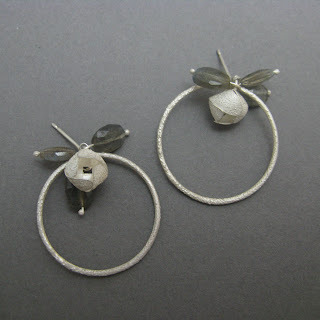 My mum's being a 'coast ring' by the very talented Miss Hannah Louise Lamb. The ring is 18ct yellow gold and is separated in two parts by the Anglesey Coastline, mainly Treaddur Bay where they live. If you haven't seen Hannah's coastline rings before, click on Hannah above. The perfect wedding ring. Each one is handmade specially and is personal to each and every couple. Members of the wedding party including the bride herself were also wearing some familiar jewellery :) My mother's necklace and bracelet were both of the 'Butterflower' range and made from silver & 18ct gold. 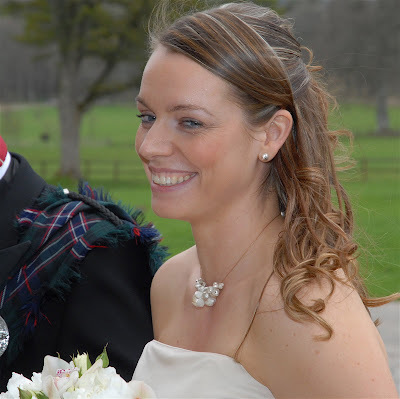 My sister Lisa, was wearing her very own Donna Barry 'Blossom bud Cluster' necklace, that was specially made for her own wedding day, three years ago. Above are a few pics of the day and of course the jewels! So it's all work work work now! Holiday blues have been dealt with and I'm all geared up for the Open Studios which is 5th-7th Aug and DAZZLE 5th-29th Aug! More on these later. I have been working on a couple of new things which I'll post up next week too. 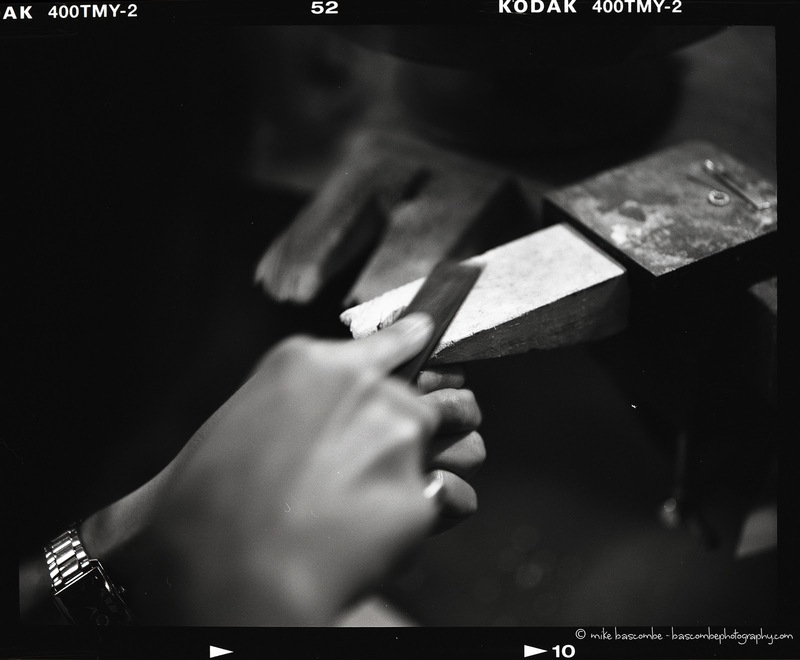 Last week, the very first 'Make Your Own Wedding Rings' took place at Coburg House Studios. Hannah Louise Lamb and I were excited and nervous to have Emma Walker, Director of Craftscotland and husband to be, Mick Pritchard, join us in teaching them how to make each other's wedding rings! Here Emma decribes their experience. Thank you to Emma and Mick for putting their trust in us as tutors, and for being our first ever 'Make Your Own Wedding Rings' couple! You were great! You can also check out our short film on YouTube demonstrating the ring making process below. It's all about weddings at the moment. It's that time of year when Brides To Be are preparing for their big day! Clare Chandler, owner of Clifton Rocks in Bristol, sent me this link the other day! I was delighted to find my Butterflower Drop earrings being modelled on page 49! If you'd like a wee look click here and then click on the online wedding magazine. Today, I had a visit from Sarah Dallas, owner and manager of the Sarah Dallas Gallery, a lovely little place in Stockbridge (Edinburgh). She chose a collection for her gallery which will be on show as from the 5th March. 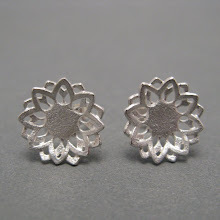 There will be some similar 'Butterflower Drop' earrings there too if you feel the urge to make a statement on your big day or any other special occasion for that matter. The earrings above a different version again from that of the ones at Sarah Dallas and Clifton Rocks. They do however, have the same impact! If you are looking for some special presents for the bridesmaids or mothers of the bride and groom, just give me a call and we can arrange an appointment at my studio. 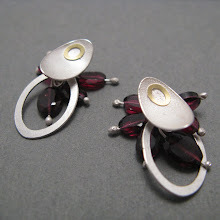 I have a diverse range of designs in earrings, pins, brooches, pendants and more. If you're not based in Edinburgh you can find your nearest stockist (scroll down on the right) or if you'd like to order something you find on here, get in touch and we can take it from there. Well hello! Apologies for not keeping you up to date with what's been happening recently. I have to admit I haven't really made anything since before Christmas. That doesn't mean to say I haven't been busy though! Amongst tax returns and planning the year ahead, myself and Hannah Louise Lamb have a new and exciting venture to share with you all! As you may have guessed from the title, we are setting up a workshop where couples who are about to get married can come and use our studio and our expertise for the day to make each others wedding rings! Check our new blog for more details! Bookings are now being taken! Over the weekend, I had a visitor over from the Isle Of Arran. Ann spent the day with me in my studio making wedding rings for her friends. She made a lovely pair of 18ct white gold polished rings! You can see her in action in the photos above! I am also taking on one to one students now. So if you fancy learning the basic traditional techniques of jewellery making, or if you've had a bit of experience already and would like to learn more, please get in touch. We can discuss what it is you would like to do or I could set you a project! It's up to you! You can book for a five session block which is £200 (£20 an hour).